The good people at BLUFF Magazine picked up on this story yesterday, when they discovered a new poker-related item on EBay, and while it is gold and comes from winning a prestigious tournament, it’s only gold in color and worth far less than a WSOP bracelet –which was the EBay craze at the end of 2010. No, this time around it is a FTOPS Gold Jersey that is up for auction on EBay. 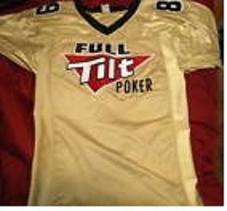 BLUFF Magazine has surmised that the jersey likely belongs to “thekellster89″ who was a winner during the FTOPS XIII tournament series. “thekellster89” apparently tried to part with the jersey through the 2+2 poker forums last July for the bargain price of $150; now he is asking quite a bit more on EBay, as his auction has a buy-it now price of $500 –perhaps the economy is improving! The Gold Football Jersey emblazoned with the Full Tilt Poker logo and adorned with the number 89 sold earlier today for $250; so if the seller was “thekellster89” he picked up an extra $100 by going to EBay –minus any auction fees—even though he settled for half of his asking price. No word yet if he will donate the proceeds to UNICEF, a la Peter Eastgate, but I wouldn’t hold my breath on that one. We’ll have to wait and see what the next piece of poker memorabilia is that hits the online auction house will be. This entry was posted on Friday, April 8th, 2011 at 8:39 am and is filed under Poker News. You can follow any responses to this entry through the RSS 2.0 feed. You can leave a response, or trackback from your own site.